It doesn't seem possible tomorrow is May 1st, but here we are! It's time to review another month of interesting viewing choices on Turner Classic Movies. Esther Williams is the May Star of the Month, with her films airing beginning Thursday, May 5th. I'll be posting more details on that a couple of days from now. 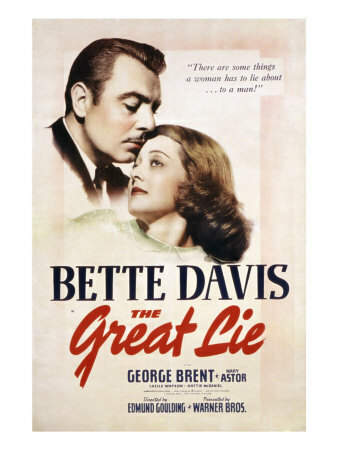 ...May 3rd is an eight-film tribute to Mary Astor, including the classic comedy MIDNIGHT (1939) and Astor's Oscar-winning role in THE GREAT LIE (1941). 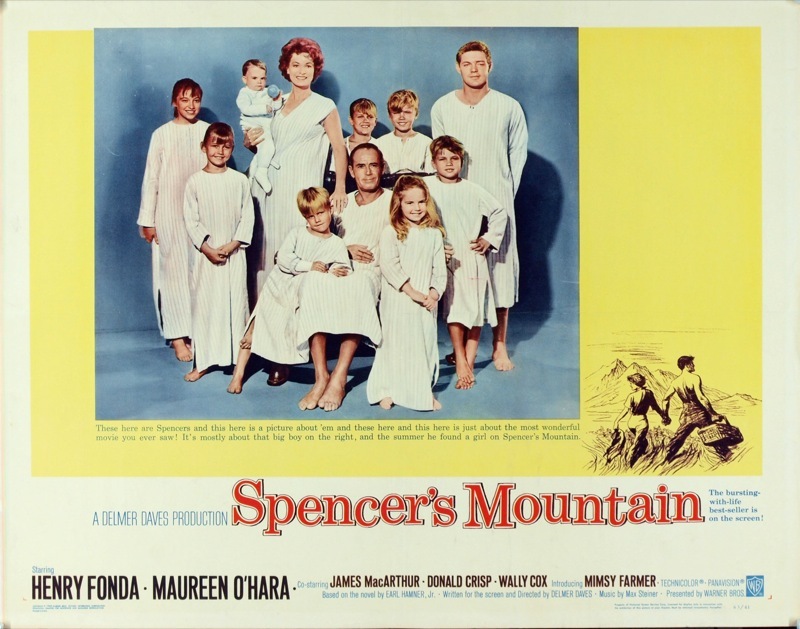 ...On May 5th there's a lineup of "family" films including MOTHER CAREY'S CHICKENS (1941), YOU CAN'T TAKE IT WITH YOU (1938), ROOM FOR ONE MORE (1952), THE HAPPY TIME (1952), and SPENCER'S MOUNTAIN (1963). SPENCER'S MOUNTAIN, based on a book by Earl Hamner Jr., stars Maureen O'Hara and Henry Fonda, with James MacArthur as "Clayboy." ...BACK FROM ETERNITY (1956), shown on May 7th, is a remake of the classic "B" movie FIVE CAME BACK (1939), about plane passengers stranded in a Very Bad Place. Robert Ryan stars, and that's reason enough for many of us to be interested in seeing it. ...Mother's Day, on May 8th, has a day-long schedule of films celebrating mothers. If you've never seen it, treat yourself to Irene Dunne in one of her best roles, starring in I REMEMBER MAMA (1948). 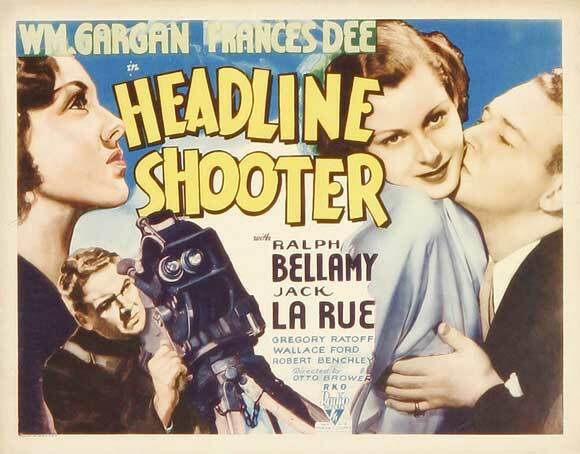 Dunne received her fifth and final Best Actress nomination for this movie; it's a shame she never received one, given the excellence of her career. Dunne could do it all: comedy, drama, accents, and a beautiful singing voice, too. 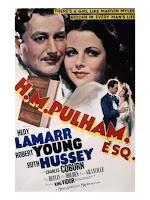 ...I've not seen it yet, but have read that some think Hedy Lamarr's best role was in H.M. PULHAM, ESQ. 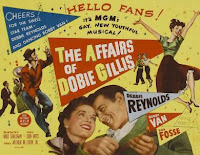 (1941), also starring Robert Young. It's on May 9th. ...Also on the 9th, I'm quite intrigued by the pairing of Joan Fontaine and Mario Lanza in SERENADE (1956), directed by Anthony Mann. ...May 11th is "must viewing" for classic film fans. An interesting lineup of Joan Bennett titles kicks off with Fritz Lang's SCARLET STREET (1945), costarring Edward G. Robinson and Dan Duryea. The real highlight of the evening, however, is the rarely seen TRADE WINDS (1938), costarring Fredric March, Ann Sothern, and Ralph Bellamy. During the course of this film Bennett transforms herself from a blonde to a brunette -- and she remained a brunette for the rest of her career! 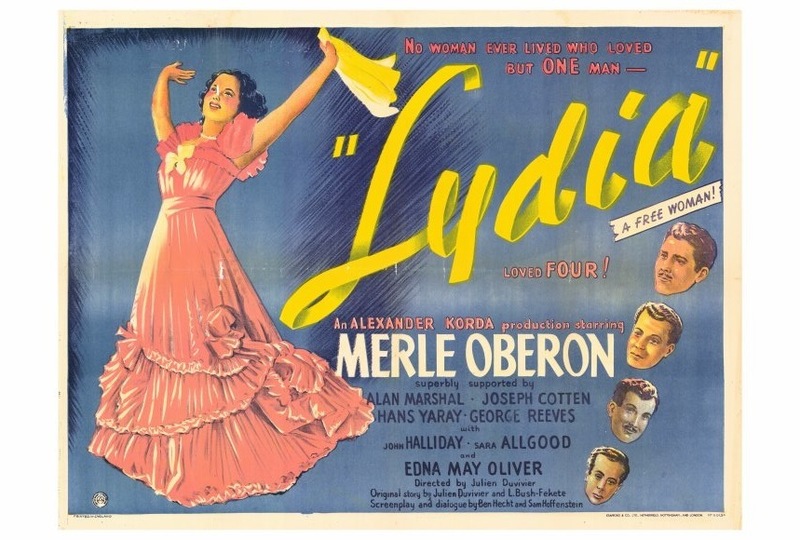 ...After TRADE WINDS, the film I'm most excited about in May is LYDIA (1941), starring Merle Oberon and Joseph Cotten. I read about it years ago in Lawrence J. Quirk's THE GREAT ROMANTIC FILMS, but this will be my first opportunity to see it. It airs Sunday, May 15th. ...A day of films on Henry Fonda's birthday, May 16th, includes one of his finest roles, in John Ford's YOUNG MR. LINCOLN (1939). Listen for Alfred Newman's "Ann Rutledge Theme," which reappears in later films including BELLE STARR (1941) and Ford's THE MAN WHO SHOT LIBERTY VALANCE (1962). 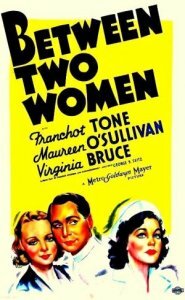 ...One of the completely unknown titles I plan to check out this month is BETWEEN TWO WOMEN (1937), starring Franchot Tone, Maureen O'Sullivan, and Virginia Bruce. It airs May 17th as part of a nine-film O'Sullivan birthday tribute. Other choice titles that day include PAYMENT DEFERRED (1932) with Ray Milland and WOMAN WANTED (1935) with Joel McCrea. ...May 20th is James Stewart's birthday. There are several excellent films on the schedule; those who've never seen him in ANATOMY OF A MURDER (1959) should make plans to check it out. He's superb. I love the bits with his fishing tackle. ...VALLEY OF THE KINGS (1954) is on May 21st. One of my daughters and I came across this Robert Taylor-Eleanor Parker film on a Saturday morning a few years ago, and we couldn't stop watching. It's not really a great movie, but it's quite entertaining. ...The romantic comedy SUNDAY IN NEW YORK (1963) was recently issued by the Warner Archive in a remastered widescreen print. 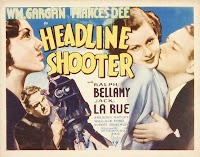 TCM has showed a pan and scan print of this film in the past, and TCM's Now Playing guide doesn't indicate the May 22nd airing will be widescreen; I hope they're going to be able to upgrade the print they show at some point. 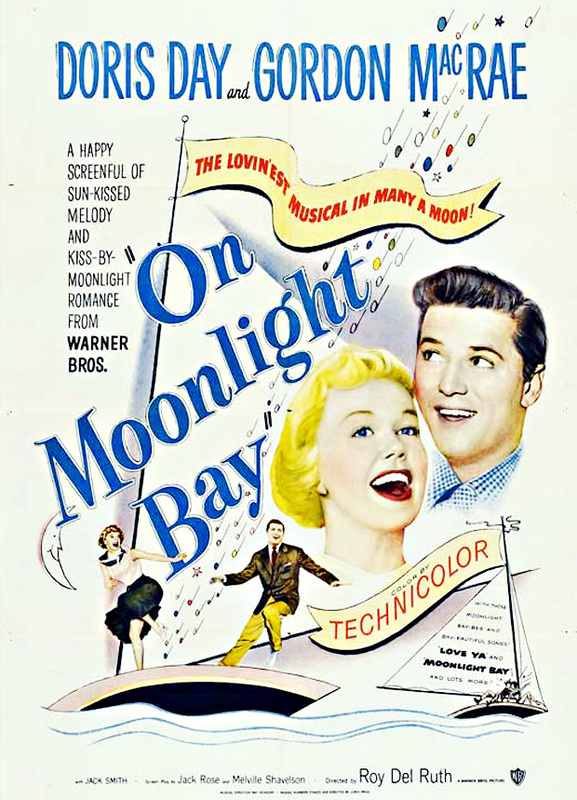 ...ON MOONLIGHT BAY (1951) is a favorite Doris Day musical, with a nice MEET ME IN ST. LOUIS feel to it -- it's even got Leon Ames playing her father. 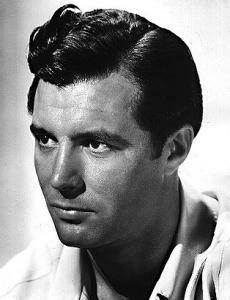 Gordon MacRae is the boy next door. It's shown on May 23rd. ...SOUTH PACIFIC (1958) is one of the weaker translations of Rodgers & Hammerstein from stage to screen -- I'll never understand the colored lenses! -- but it's still got a lot to recommend it, including Mitzi Gaynor in the lead, Ray Walston perfectly cast as Luther Billis, and superb orchestrations of the brilliant score. It's definitely worth checking out when TCM shows it on May 24th. ...Director Archie Mayo will be honored with a six-film tribute on May 25th, including a pre-Code I've heard is quite good, THE LIFE OF JIMMY DOLAN (1933), starring Douglas Fairbanks Jr. and Loretta Young. I suspect the film might be worth watching even if only to see two of the most attractive stars of '30s films! ...There's another birthday tribute on May 26th, this time celebrating John Wayne. There's a bunch of good movies on tap, including the cute romantic comedy WITHOUT RESERVATIONS (1946), but I consider the pick of the day to be RIO BRAVO (1959), which is simply one of the greatest Westerns ever made. Wayne's character even inspired the name of our dog, Chance! ...I love submarine movies, and Robert Montgomery in a submarine is even better! 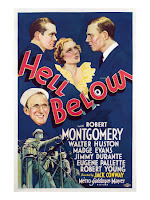 The pre-Code HELL BELOW (1933) will be shown as part of the Memorial Day weekend lineup on Friday, May 27th. It teams Montgomery with his frequent costar Madge Evans, and it costars Walter Huston, Eugene Pallette, Robert Young, and Jimmy Durante (?!). 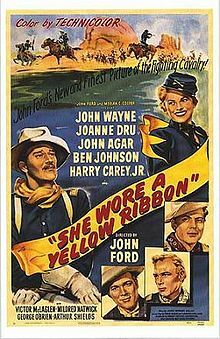 ...Montgomery will be seen again on the 29th in one of the truly great war films, THEY WERE EXPENDABLE (1945), costarring John Wayne and Donna Reed. Montgomery also did uncredited work on the film assisting director John Ford. ...There are many more classic war films showing Memorial Day weekend, including Cary Grant in DESTINATION TOKYO (1943) on the 27th, Spencer Tracy in THIRTY SECONDS OVER TOKYO (1944) on the 28th, Van Johnson, Ricardo Montalban, John Hodiak, and James Whitmore in BATTLEGROUND (1949) on the 29th, and SINCE YOU WENT AWAY (1944) and THE BEST YEARS OF OUR LIVES (1946) on the 30th. ...After a weekend paying tribute to the military, the month concludes on a lighter note on the 31st, with a batch of Westerns, including Roy Rogers and Dale Evans in MY PAL TRIGGER (1946) and Fred MacMurray and Anne Baxter in the 20th Century-Fox film SMOKY (1946). I'm always glad to see a Fox film turn up on TCM. There are many more excellent movies playing on TCM this month; for further information, please consult the complete schedule. Update: TCM Star of the Month: Esther Williams. This seems to be the week for George Murphy movies! 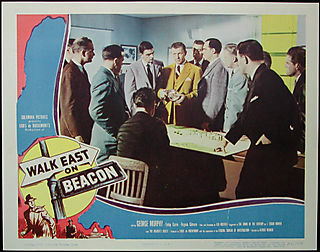 A few days ago I watched his last feature film, the docu-noir WALK EAST ON BEACON! (1952). This evening was a much different film, released over a decade earlier, the screwball comedy A GIRL, A GUY, AND A GOB. 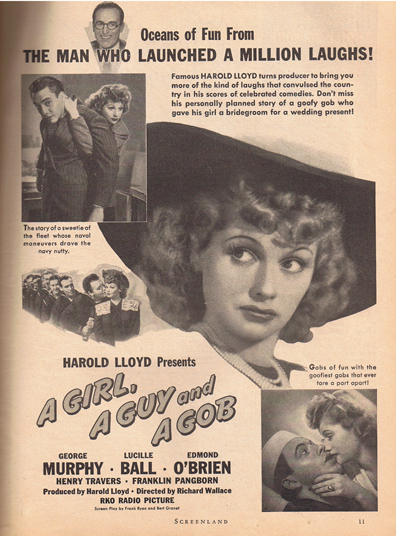 Lucille Ball is the girl of the title, Edmond O'Brien is the guy, and Murphy plays the "gob," a Navy man. The film isn't the best of the genre, but it periodically has brief flashes of screwball greatness, and it makes for a pleasant way to pass the time. Dot (Ball) is a working class secretary who has a classic "cute meet" with shipping executive Stephen (O'Brien) when they argue over seats at the opera. When Dot unexpectedly shows up the next day as Stephen's new secretary, she thinks she'll be fired, but he lets her stay on the job. As Stephen gets to know Dot and her sailor boyfriend, improbably nicknamed Coffee Cup (Murphy), he realizes they're a lot more fun than his stuffy fiancee Cecilia (Marguerite Chapman). The quiet Stephen starts to come out of his shell when he spends time with his new friends. Eventually Stephen falls for Dot, but he's reluctant to be disloyal to Coffee Cup and declare his true feelings. Who will Dot wed? The central premise of the film is both its strength and its weakness. The three leads are fun together, and their loyalty to one another is charming, such as when Stephen finds a way to give Coffee Cup $200 to marry Dot, even though he loves Dot himself. And yet, with both leading men genuinely nice guys, the audience feels as conflicted at times as Dot herself! There's a scene where Coffee Cup tenderly comforts Dot over ice cream bars that really makes the viewer wonder which man should be Dot's husband and which is her friend. And to top it off, viewers are cheated out of the chance to see Dot in a final romantic clinch. One of the film's strengths is the supporting cast. Franklin Pangborn, in one of his patented prissy roles, plays a pet shop owner. A melee at the pet store calls to mind the famous Automat scene in EASY LIVING (1937). Pangborn later has a moment with a broom and a window which is quite funny, even if viewers know what to expect the minute he picks up the broom. Dot's eccentric family life lightly echoes another Jean Arthur screwball, YOU CAN'T TAKE IT WITH YOU (1938). Her parents are played by Kathleen Howard and George Cleveland. 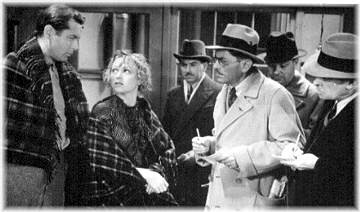 The cast also includes Henry Travers, Lloyd Corrigan, Frank McGlynn Sr., Doodles Weaver, and Nella Walker. This 90-minute movie was directed by Richard Wallace. It's interesting to note the film was produced by comedy great Harold Lloyd. A GIRL, A GUY, AND A GOB is an RKO film which was released on VHS. It's also been shown on Turner Classic Movies. ...At Libertas, Jennifer Baldwin has written a very interesting review of a Glenn Ford-Gloria Grahame film I've not yet seen, Fritz Lang's HUMAN DESIRE (1954). I'm very much looking forward to both that film and Ford and Grahame's THE BIG HEAT (1953). I found the article via the Self-Styled Siren's "More Link Love" post last week. I very much appreciate the Siren linking to my review of MADE ON BROADWAY (1933) in the same post! ...Last Tuesday, the Steven Spielberg Scoring Stage at the University of Southern California School of Cinematic Arts was renamed the John Williams Scoring Stage. Longtime USC benefactors Spielberg and George Lucas were in attendance. Williams said that the hall bearing his name was "probably...the greatest honor I have ever received." Read more in an article by film music historian Jon Burlingame at The Film Music Society. 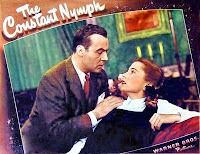 ...Lou Lumenick had the chance to see THE CONSTANT NYMPH (1943) at the TCM Film Festival. Lumenick comments on Joan Fontaine's remarkably natural performance as the teenaged Tessa, saying he's "I've never seen a better Joan Fontaine performance," and I'm inclined to agree. I so look forward to this film being released on DVD! 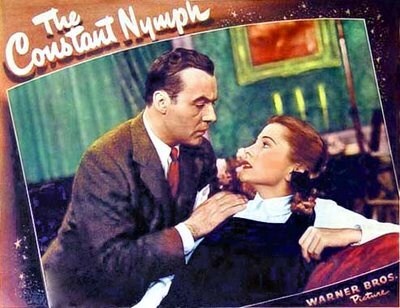 ...Susan King of the L.A. Times wrote a brief story last week about the long-unavailable THE CONSTANT NYMPH and NIGHT FLIGHT (1933) being on the schedule at the TCM Festival. 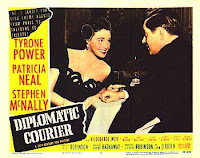 ...Reviews, reviews, and more reviews: Tyrone Power in DIPLOMATIC COURIER (1952) was reviewed at Riding the High Country...Java's Journey looks at a favorite screwball comedy, EASY LIVING (1937), starring Jean Arthur and Ray Milland...Classic Movie Gab reviews a very different Milland film, SO EVIL MY LOVE (1948)...Classicfilmboy's Movie Paradise reviews Spencer Tracy and Loretta Young in Frank Borzage's MAN'S CASTLE (1933)...and She Blogged By Night has some nice screen caps and analysis of William Holden's performance in ESCAPE FROM FORT BRAVO (1953). ...One of the locations for the TCM Festival, the Chinese Theatre on Hollywood Boulevard, is being sold. ...At Skeins of Thought, Moira reviews DRANGO (1957), a post Civil War film starring Jeff Chandler, Joanne Dru, and Julie London. Moira's thoughtful review makes this film sound really interesting. I'd never really cared for Chandler until enjoying him in FEMALE ON THE BEACH (1955) at the Noir City Film Festival this month. ...Garbo Laughs has an informative list of titles coming to Netflix streaming in May, as well as a list of titles which are expiring. ...When I saw Catherine Middleton's beautiful, classic wedding dress yesterday, the lace bodice immediately brought to mind Grace Kelly's wedding dress, created by MGM costume designer Helen Rose. Comet Over Hollywood was thinking along the same lines. ...The Petersen Automotive Museum in Los Angeles just received a $100 million gift from one of the museum's founders, Margie Peterson. 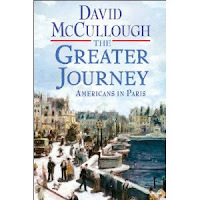 ...New books for history buffs: THE SIEGE OF WASHINGTON: THE UNTOLD STORY OF THE TWELVE DAYS THAT SHOOK THE UNION by John and Charles Lockwood, which was released this month, and THE GREATER JOURNEY: AMERICANS IN PARIS by David McCullough, due in May. ...More classic film reviews? Right here! Cin-Eater reviews Jon Hall and Maria Montez in ARABIAN NIGHTS (1942)...John Greco reviews Ray Milland and Ginger Rogers in Billy Wilder's THE MAJOR AND THE MINOR (1942) at Twenty Four Frames...Ivan posts about two pre-Code titles, BLOOD MONEY (1933) and PLEASURE CRUISE (1933), at Thrilling Days of Yesteryear...Mike Clark takes a look at the new DVD-R release of NOT AS A STRANGER (1955) at Home Media Magazine. 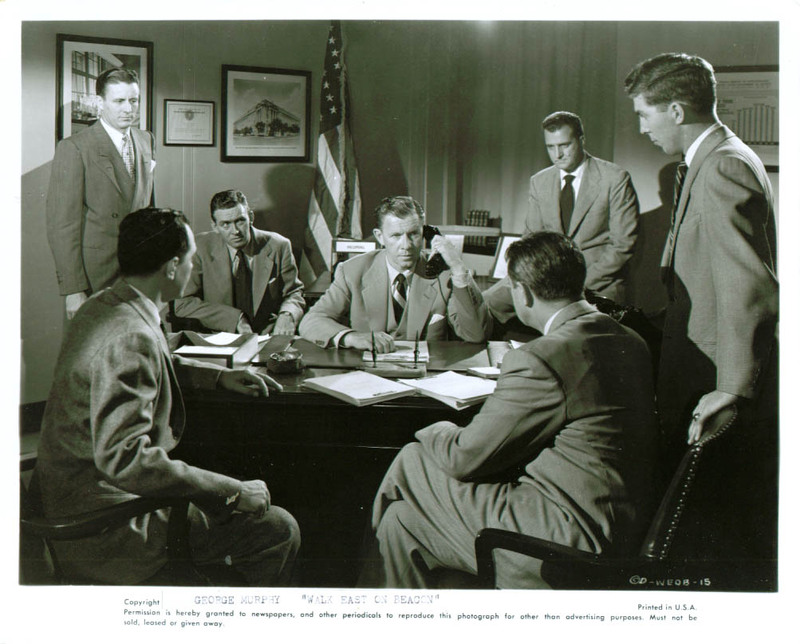 NOT AS A STRANGER stars Frank Sinatra, Robert Mitchum, and Olivia de Havilland...and Glenn Erickson reviews BEYOND A REASONABLE DOUBT (1956) and WHILE THE CITY SLEEPS (1956), both recently out from the Warner Archive. ...There are more links for this week in my Guest Linking post at Classic Movies! 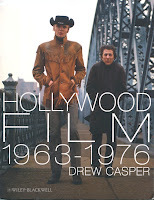 My thanks to Chris Yogerst for letting me know about a new book by USC's great film professor Drew Casper, HOLLYWOOD FILM 1963-1976: YEARS OF REVOLUTION AND REACTION. A little Internet surfing brought me to a recent interview with Casper about the book on the USC website. 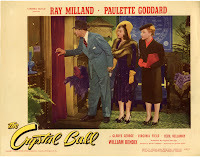 It sounds quite fascinating, as Casper's goal was to look at the era from a new perspective: "It was a challenge not to fall into the trap as most have of seeing this period as one in which Hollywood indulged in liberalist critique"; Casper looks at the era more broadly, examining what he describes as conservative, centrist, and "classical" style films of the era. He says, "I wanted to talk about films and filmmakers who are usually not part of the canon erected by historians who addressed this period." 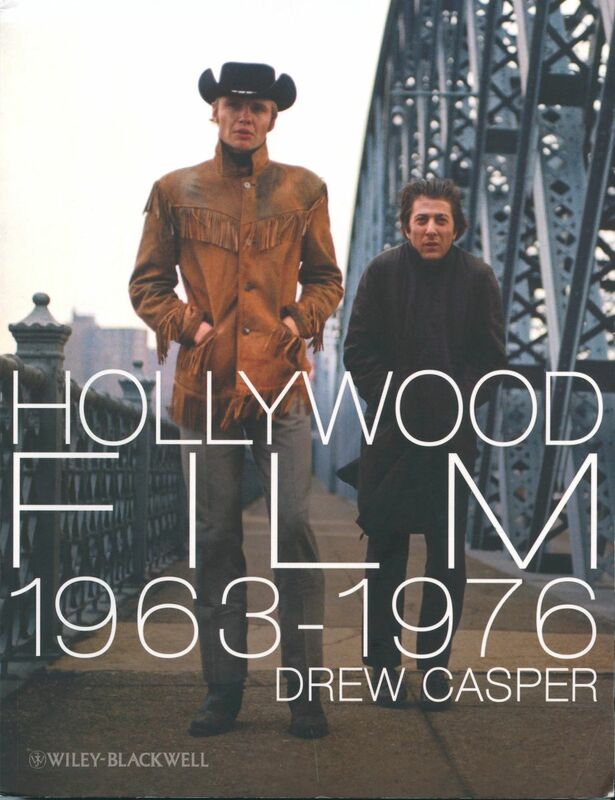 The films Casper covers in the book include Stanley Donen's TWO FOR THE ROAD, Martin Ritt's THE SPY WHO CAME IN FROM THE COLD, and Disney's MARY POPPINS; he also feels John Wayne in TRUE GRIT "leaves Jeff Bridges' interpretation in the remake in the dust." Sounds like another title for my reading wish list! Chris will be reviewing the book soon for Big Hollywood, and I'll be sure to link to it here. May 20th Update: Here's the review! 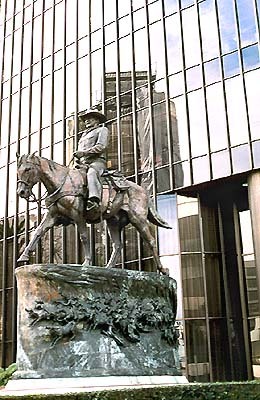 ...My daughter was recently driving down Wilshire Boulevard in Los Angeles and wondered why there was -- seemingly randomly -- a magnificent statue of John Wayne on horseback in front of an office building. We explained that "back in the day" it had been the Great Western Savings building and that Great Western had commissioned the sculpture of Wayne after his death. Harry Jackson, the statue's sculptor, has passed away at the age of 87. There's more about Jackson's work at the Harry Jackson Studios website. ...Architect Eldon Davis, another creator of memorable Los Angeles landmarks, had died at the age of 94. Davis, a 1942 graduate of USC, designed many buildings in the "Googie" Space Age style, including Johnie's on Wilshire Boulevard and Norm's on La Cienaga Boulevard. Click here for photos of some of Davis's work. Remarkably, Davis was said to have been running marathons until a couple of years ago. L.A. Observed also pays tribute, and here's more about the architectural firm of Armet & Davis (via laist). The Orange County Register links to examples of Googie design. 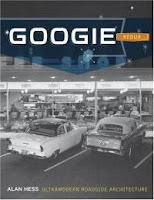 I highly recommend the book GOOGIE REDUX by Alan Hess for those interested in learning more. ...Marvin Eisenman, a film collector also known as "Marvin of the Movies," has passed on at the age of 83. Eisenman may have had the largest private film collection in the world. Leonard Maltin has paid tribute at his site, saying of Eisenman that "His reward was the satisfaction of providing movies to people who wanted to see them." The L.A. Times says that Eisenman's "family has tentative plans to donate his collection to a film library." Nobody does a grand wedding like the British! Best wishes to the newlyweds for a long and happy life together in service to their nation. The titles released last Tuesday are THE VIRGINIAN (1946), starring Joel McCrea, Barbara Britton, and Brian Donlevy; LADY IN A JAM (1942), with Irene Dunne, Patric Knowles, and Ralph Bellamy; MAN IN THE SHADOW (1957) with Orson Welles and Jeff Chandler; and THE BALLAD OF JOSIE (1967) with Doris Day and Peter Graves. I love Irene Dunne comedies and am really looking forward to LADY IN A JAM! 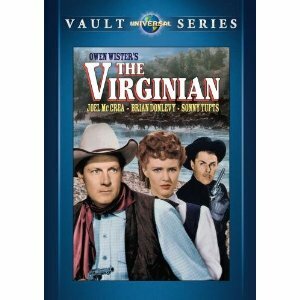 I reviewed the VHS edition of THE VIRGINIAN in 2010. Previous posts on the Universal Vault Series: New on DVD: The Black Shield of Falworth (1954); Disneyland in 40 Pounds of Trouble (1962). The Gregory Peck postage stamp, first mentioned here in January, was issued today. The ceremony was held at the Motion Picture Academy's Samuel Goldwyn Theater. Peck served as the Academy President from 1967 to 1970. Peck is the 17th actor honored in the Legends of Hollywood stamp series. 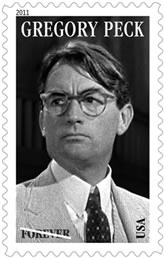 The first class stamp, featuring a portrait of Peck as he appeared in TO KILL A MOCKINGBIRD (1962), is now on sale. As I mentioned last weekend, KC of Classic Movies is preparing for maternity leave; she invited a bevy of classic film bloggers to prepare the "Classic Links" feature at her site over the past couple of weeks. I was delighted to participate, and you can find my contribution posted today. For those of you who are new to the Classic Movies blog, KC's Classic Links is one of my favorite classic film blog features; she's introduced me to a number of other interesting blogs. She also provides Classic Birthdays, a Quote of the Week, and other fun stuff. I recommend bookmarking it and visiting on a regular basis! Thanks to KC for the invitation and the very kind words at her site, and best wishes on the upcoming arrival! Friday Update: A closing word from KC. It's been less than two weeks since Turner Classic Movies previewed its July schedule, and the August schedule is already posted! Perhaps the good folks at TCM wanted to get work out of the way before this weekend's TCM Festival. The Summer Under the Stars schedule's been released nearly a month earlier than it was released last year. Please note that since TCM overhauled its site -- I can't use the word "upgraded," unfortunately -- the schedule for the 31st has not been accessible for either the July or August schedules. So the star being celebrated on August 31st remains a mystery for now. Here's the complete list, minus the 31st, of the actors whose work will be celebrated with 24-hour marathons in August 2011. They're listed in date order. I think this is a terrific list, balancing all types of actors, with a great mix of films including pre-Codes, silents, foreign films, musicals, you name it. There are a couple people listed I don't really care about, but I'm thrilled about other names on the list -- the Linda Darnell day alone makes the entire schedule for me! The Darnell schedule includes HOTEL FOR WOMEN (1939), a title I've long wished to see, starring Darnell, Ann Sothern, and Lynn Bari; and TWO FLAGS WEST (1950), a Western Darnell made with Joseph Cotten for director Robert Wise. There's actually a trailer for TWO FLAGS WEST on one of my Fox DVDs, with a notice that it would soon be released to DVD, but it never happened. 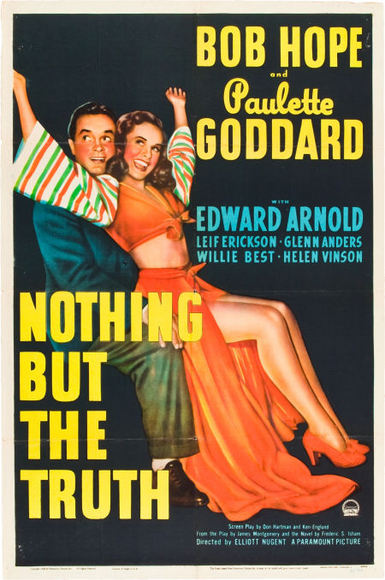 I'm also delighted by the inclusion of Paulette Goddard on the schedule, although unfortunately TCM hasn't yet obtained more of her Paramount titles. Hopefully movies like HOLD BACK THE DAWN (1941), THE LADY HAS PLANS (1942), and STANDING ROOM ONLY (1944) will turn up in the future, along with THE FOREST RANGERS (1942), I LOVE A SOLDIER (1944), SUDDENLY IT'S SPRING (1947), and others I'd love to see. 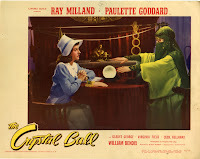 Still, I'm appreciative that TCM has brought Goddard films like KITTY (1945) and THE CRYSTAL BALL (1943) to the network within the past couple years; anyone who missed THE CRYSTAL BALL a few days ago will have another chance on August 2nd! I'll share more thoughts on the August schedule in late July. Stars of the Month coming prior to August: Esther Williams in May, Jean Simmons in June, and cowboy heroes in July. There's great summer viewing ahead for classic film fans! It's been announced that Cary Grant's daughter, Jennifer, has written a memoir. 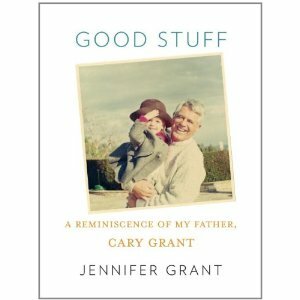 GOOD STUFF: A REMINISCENCE OF MY FATHER, CARY GRANT, will be published a week from tomorrow, on May 3rd. Jennifer Grant was 20 when her father passed away in 1986. Publishers Weekly and People Magazine have more information. Jennifer said she wanted to write a book which would make her father proud. "I clutched my memories of him to my heart for so long, but he’s a part of the world. The book is now in your hands." WALK EAST ON BEACON! is an entertaining FBI procedural in the tradition of films such as THE HOUSE ON 92ND STREET (1945) and WALK A CROOKED MILE (1948). The movie will be particularly enjoyed by those such as myself who enjoy the "docu-noir" style and are interested in the Cold War era. WALK EAST ON BEACON! 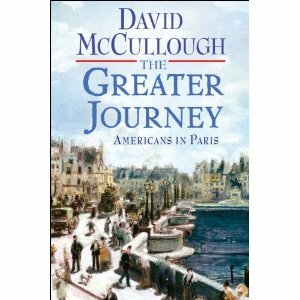 was produced by Louis de Rochemont, who also produced the aforementioned THE HOUSE ON 92ND STREET. The movie was filmed in "New England, U.S.A.," per the end title card, and it has just a handful of recognizable actors in the lead roles. George Murphy, in his last feature film, plays the FBI man heading the investigation into a Soviet spy ring; Finlay Currie is a scientist being blackmailed by the Soviets; and Virginia Gilmore is a Russian spy. Among the supporting players are future director George Roy Hill (THE STING) and his wife, Louisa Horton. The film is narrated by Westbrook Van Voorhis. The low-key Murphy is well-cast as the lead investigator. It's quite interesting watching the methodology of both the Communist spies and the FBI, and extensive location photography in Boston and Washington, D.C., adds to the ambience. The film builds to an exciting climax involving spies being rounded up in Washington and at sea. It's not a great film, but it's entertaining; I find films such as WALK EAST ON BEACON! fascinating on multiple levels. I love the peek into law enforcement practices, technology, and forensic work of the time period; the movie is also noteworthy as a reflection of our national concerns at the time and what messages the filmmakers wanted to communicate to the moviegoing public. 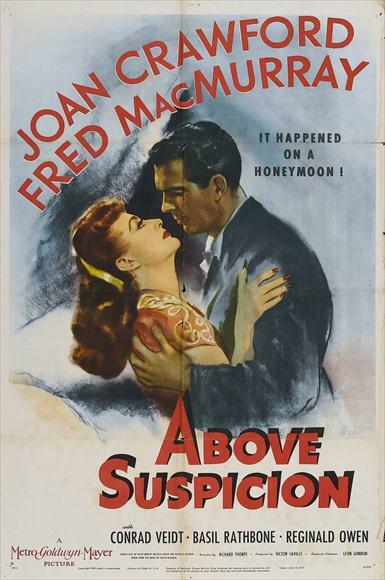 I was curious to know how the film was received upon its release, and found that the original New York Times review described the film as "expertly turned melodrama" and said the movie was "always interesting and sometimes exciting...an absorbing affair...a swiftly paced, detail-filled yarn." WALK EAST ON BEACON! was directed by Alfred L. Werker. It was the second film photographed by Joseph Brun; the following year he was nominated for the Oscar for photographing MARTIN LUTHER. The movie runs 98 minutes. WALK EAST ON BEACON! isn't available on DVD or VHS. 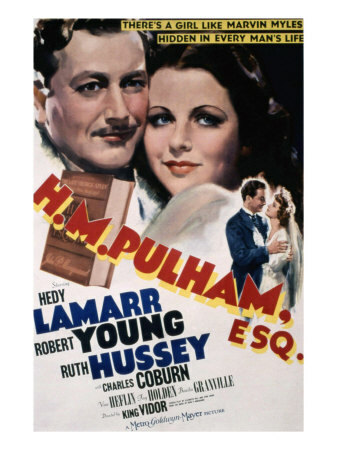 It's a Columbia film which has been shown on Turner Classic Movies. May 2013 Update: WALK EAST ON BEACON! will be released on DVD this summer from the TCM Vault Collection. MADE ON BROADWAY is a diverting pre-Code movie with strong overtones of the venerable PYGMALION and CHICAGO stories, which have both been filmed numerous times, including in 1942's ROXIE HART. Jim Bidwell (Robert Montgomery) is the greatest publicity man in New York. He creatively solves the problems of everyone from the mayor (C. Henry Gordon) to lovely Adele Manners (Jean Parker). He's also got a charming ex-wife, Claire (Madge Evans), who curiously enough also appears to be his best friend. When a poor young woman (Sally Eilers) jumps off a ferry boat in a suicide attempt, Jeff dives in and rescues her. He takes her under his wing, christens her "Mona Martine," and with Claire's help he sees that Mona has grammar lessons and the perfect wardrobe. Mona lands a job in the Follies, but it all goes south when she shoots and kills a man (Ivan Lebedeff) in her apartment. Jeff goes into action to solve this problem as well, drumming up favorable publicity and swaying the jury in not-so-innocent Mona's favor. This is Robert Montgomery's film all the way. Watching the fast-talking Bidwell swing into gear, barking orders right and left, when he learns of the murder calls to mind James Cagney's tour de force near the conclusion of ONE, TWO, THREE (1961), filmed nearly three decades later. Bidwell also has a vulnerable side, which he only displays with those closest to him, chiefly ex-wife Claire and his butler, Mike (Eugene Pallette). Jeff and Claire have a rather unusual relationship, each apparently regretting their divorce but not quite willing to say it. The actors who played Jeff and Claire, Montgomery and Evans, were lifelong friends. They also appeared together in LOVERS COURAGEOUS (1932), HELL BELOW (1933), FUGITIVE LOVERS (1934), and PICCADILLY JIM (1936). Evans was married to playwright Sidney Kingsley. Sally Eilers is effective as Mona, allowing both the lower-class and duplicitous aspects of her nature to show through behind Jeff's more refined creation. She also causes the audience to dislike her heartily! MADE ON BROADWAY was directed by Harry Beaumont, who also directed Montgomery in OUR BLUSHING BRIDES (1930), FAITHLESS (1932), and WHEN LADIES MEET (1933). The cinematographer was Norbert Brodine, whose long career began in the silent era and lasted roughly four decades. Brodine's films included the film noir SOMEWHERE IN THE NIGHT (1946), seen just a few days ago. This 68-minute film isn't available on DVD or video -- isn't Montgomery overdue for a bunch more of his films to be released by the Warner Archive? -- but it's been shown in the past by Turner Classic Movies. The trailer is available at the TCM website. April 28th Update: Welcome to readers of the Self-Styled Siren! BACHELOR IN PARADISE, with its colorful "California coral" houses dotting the landscape like so many Easter eggs, somehow seemed an appropriate film for an Easter afternoon! 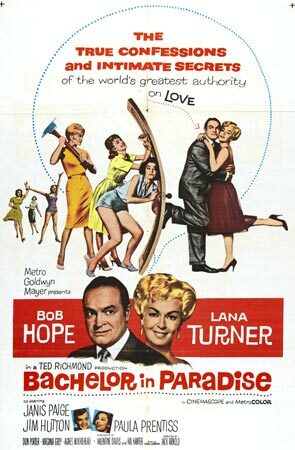 This Bob Hope film is a wonderful memento of suburban California in the '60s, with the eye-popping production design beautifully displayed in a newly remastered widescreen print from the Warner Archive. When Hope walks into his San Fernando Valley rental home and quips that it's decorated in "early Disneyland," he's not far off the mark! 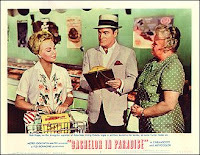 BACHELOR IN PARADISE is worth watching for the visuals alone, but this tale of a writer (Bob Hope) chronicling life in American suburbia also has a marvelous cast of "faces" and a nicely restrained, wryly funny performance by Hope. It's only a "good" film storywise, but the visuals and the cast push it across the finish line, turning it into a "must see" for those who are interested in the era. Hope's landlady is played by Lana Turner, and the ladies of the neighborhood include Paula Prentiss (who is cute as the proverbial button) and Virginia Grey, a favorite from '40s films. Janis Paige plays the would-be divorcee on the prowl, and Agnes Moorehead is very amusing as a divorce court judge. John McGiver, Jim Hutton, Clinton Sundberg, Roberta Shore, Reta Shaw, Don Porter, and Mary Treen fill out the large cast. Dodger fans will get a kick out of shots of a very young Vin Scully and Jerry Doggett calling a Dodgers game, and they'll also enjoy the film joking about fans using transistor radios at the game -- a Dodgers tradition, as even fans seeing the game in person want to hear what Vin Scully has to say about it. The film also boasts a spot-on score by Henry Mancini; he was nominated for an Oscar for the title song -- and lost to his own "Moon River" from BREAKFAST AT TIFFANY'S! 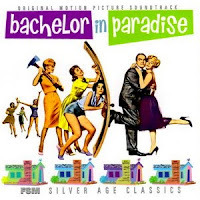 BACHELOR IN PARADISE was directed by Jack Arnold and photographed by Joseph Ruttenberg. The screenplay was written by Valentine Davies (MIRACLE ON 34TH STREET) and Hal Kanter, based on a story by Vera Caspary (the author of the novel LAURA). It runs 109 minutes. In addition to the recent Warner Archive release, this movie had a release on VHS in the mid-'90s. April 26th Update: Lou Lumenick of the New York Post has posted a brief review which also raves about the film's look: "...a detailed time capsule of a time and place, lovingly photographed by four-time Oscar winner Joseph Ruttenberg (GIGI). The widescreen views of a suburban supermarket...are positively mesmerizing." 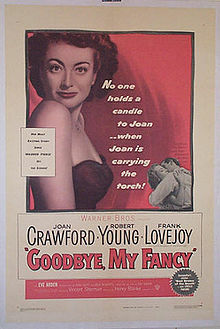 I'm pleased to share the news that my recent review of Joan Crawford in GOODBYE, MY FANCY (1951) is now available as a guest post at the MovieFanFare blog. MovieFanFare, as many readers are aware, is part of the Movies Unlimited website. I wasn't completely satisfied with GOODBYE, MY FANCY, but I nonetheless found it quite interesting, and it's a film worth checking out. Previous MovieFanFare posts: WESTBOUND (1959), TAMMY AND THE BACHELOR (1957), and A YANK IN THE R.A.F. (1941). Best Wishes to All for a Very Happy Easter Sunday! 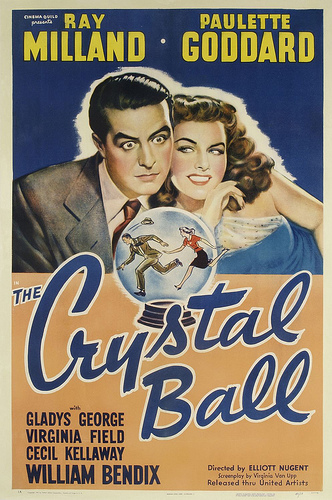 THE CRYSTAL BALL is a funny romantic comedy starring the appealing team of Ray Milland and Paulette Goddard. Goddard plays Toni Gerrard, a down-on-her-luck Texan in the big city of New York. She gets a room with a kindly fortune teller, Madame Zenobia (Gladys George), and lands a job at a shooting gallery run by Pop (Cecil Kellaway). Toni spots lawyer Brad Cavanaugh (Milland) and falls for him head over heels, then impersonates Madame Zenobia at various times in order to distract Brad's interest from his wealthy client, Jo Ainsley (Virginia Field), and land Brad herself. It's all a bit complicated to explain concisely, but the story makes sense on film...or at least it makes as much sense as a screwball comedy ever makes! There are numerous funny situations, including a series of unfortunate incidents with a waiter (Sig Arno); there's also a nice comedic payoff for a set of meetings at an apartment where Toni pretends to live. The reactions of a dog-walking lady in the apartment building, played by Mabel Paige, are quite amusing. Milland and Goddard are charming together; I especially love a scene where they're dancing and falling in love. Milland is flat-out adorable in this, with wonderful comic reactions, and Goddard is pretty terrific herself. She comes across as a funny, good-natured gal who also happens to be beautiful. Everyone seems to be having a good time in the movie, even the hapless waiter. Milland and Goddard were also teamed in THE LADY HAS PLANS (1942), REAP THE WILD WIND (1942), and KITTY (1945). 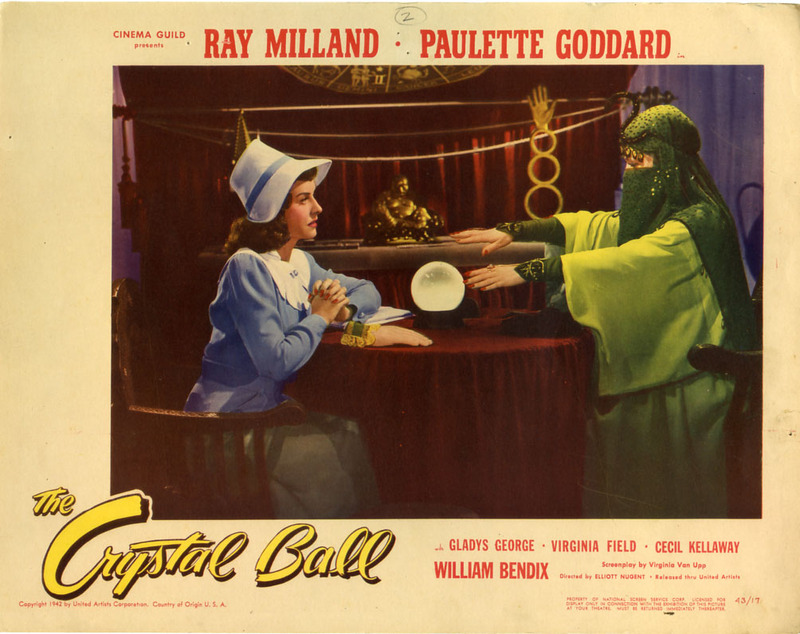 Anyone who likes Milland and/or Goddard should have a fun time with THE CRYSTAL BALL. 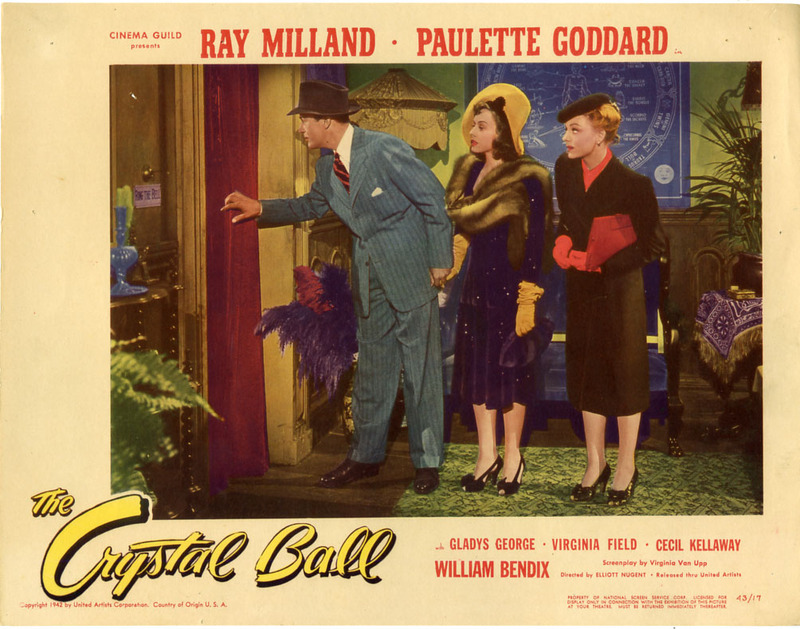 The supporting cast includes William Bendix as Milland's butler/chauffeur; in a nice touch, the back story is that he was a bowling alley owner who put Milland through law school. Mary Field, a perennial movie maid, is once again a maid here, and she's in cahoots with Madame Zenobia. Fay Helm does a nice job as Milland's perenially amused secretary. THE CRYSTAL BALL runs 81 minutes. It was directed by Elliott Nugent. The black and white cinematography was by Leo Tover. 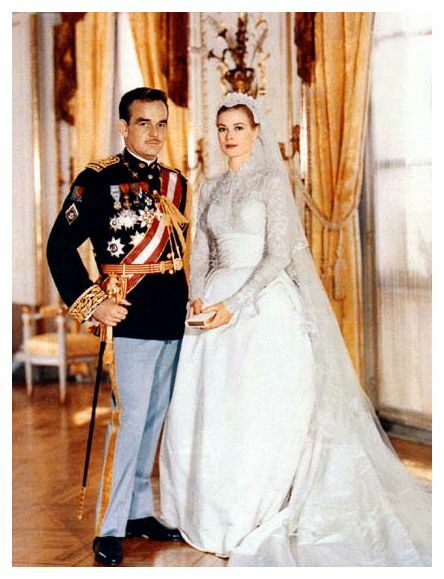 Gowns were designed by two fashion greats, Edith Head and Adrian. This is a Paramount film which was distributed by United Artists due to Paramount having too much product during WWII. It's not available on DVD or VHS, but it was recently shown by Turner Classic Movies. Hopefully there will be a DVD release in the future! 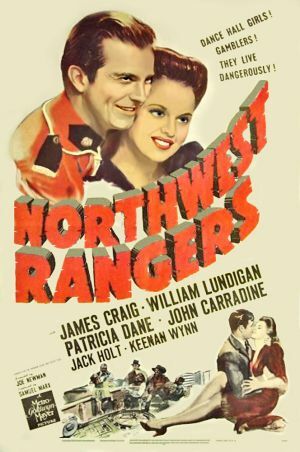 I love watching an MGM "B" movie on a weekend afternoon, and thanks to the kindness of Kristina I was able to watch NORTHWEST RANGERS today, starring James Craig and William Lundigan. The story seemed familiar from the moment I noticed that the lead characters were named Blackie and Jim, and partway into the movie I realized I was watching a Western remake of MANHATTAN MELODRAMA (1935), which starred Clark Gable, William Powell, and Myrna Loy. 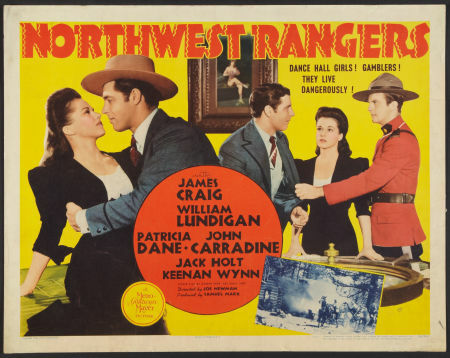 Blackie and Jim are childhood friends who are adopted by a Mountie (Jack Holt) after their parents are killed in an Indian raid. Craig has the Gable role as Blackie, translated in this abridged telling of the story into an Old West gambler and saloon owner with a big chip on his shoulder. (I noticed that although Craig often had a mustache in his films, he doesn't have one here; perhaps MGM didn't want to remind viewers too strongly of Gable?) Lundigan has the Powell role, but instead of being a D.A., he's a Mountie like his adoptive father. Eventually the time comes when Blackie breaks the law and flees, and Jim has to bring in his man. It must be admitted the film is pretty hokey at times, and the 65-minute condensation of the storyline doesn't allow for much subtlety in character development. However, while Blackie is a slightly over-the-top bad boy who's going to go his own way no matter what, there's not a lot Lundigan can do with an underwritten straight arrow role. Nonetheless, I enjoyed watching this fast-paced programmer. 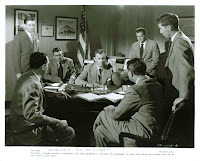 The TCM UK page has some intriguing notes indicating that the film originally was going to have a different ending, which appears to have been closer to the ending of the original MANHATTAN MELODRAMA, and that scenes were shot with a jury trial. Blackie and Jim vie for the affections of Patricia Dane as Jean. Dane is a lovely actress whose beauty and vivacity help make up for not always saying her lines believably. Dane was in a number of MGM films of the early '40s, including GRAND CENTRAL MURDER (1942); she was married to band leader Tommy Dorsey from 1943 to 1947. The film has a crackerjack supporting cast which makes it fun to watch even if it's not Grade A cinema. Along with Holt as the dedicated Mountie, Keenan Wynn does an excellent job as Blackie's loyal dealer. John Carradine is the villain of the piece as a saloon owner, and Grant Withers is another bad guy who crosses paths with Blackie. Darryl Hickman and Drew Roddy play Blackie and Jim as young boys. Part of the fun of watching a movie like this is spotting up-and-coming actors. Hugh Beaumont and Jim Davis, who would each go on to star in a popular TV series, have small roles as Mounties. Kay Medford, seen last night in THE UNDERCOVER MAN (1949), has a small role as a saloon girl. Look for Ray Teal as a poker player. NORTHWEST RANGERS was directed by Joe Newman. Location scenes were filmed in Idyllwild, California. NORTHWEST RANGERS would make a good double bill with PIERRE OF THE PLAINS, another 1942 MGM "B" movie set in Canada. 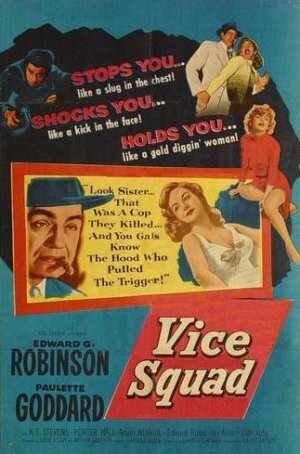 Unfortunately, this film isn't available on DVD or VHS, but it can be seen from time to time on Turner Classic Movies. Perhaps at some point in the future it will be released by the Warner Archive. The trailer is available at TCM's site here.